We did the first Market Analysis last September, and a second one in March and the third one ins September, 2016. We will continue to do this every 6 months and try to make it better with your feedback (so feel free to send suggestions or corrections to bob.bickel at runsignup.com). We do this as part of our own internal market evaluation processes, but share it since there does not seem to be a good source of information like this. In 2015, we also added our thoughts on Race Registration Market Trends and Race Registration Company Valuations (so it might be time for an update!). We did add a new section this year based on which vendors have the 100 largest festivals as measured by timed finishers by Running USA. RunSignUp has been very public about sharing our numbers. You can read our Year End Report for 2016 to see that we had over 14,000 races use us to process 4.2 Million paid registrations in 2016. The trend continues positively (see our Q1 2017 Review) – and we are estimating over 16,000 races processing registrations on RunSignUp and 4.3 Million paid (not including imported) registrations in 2017. 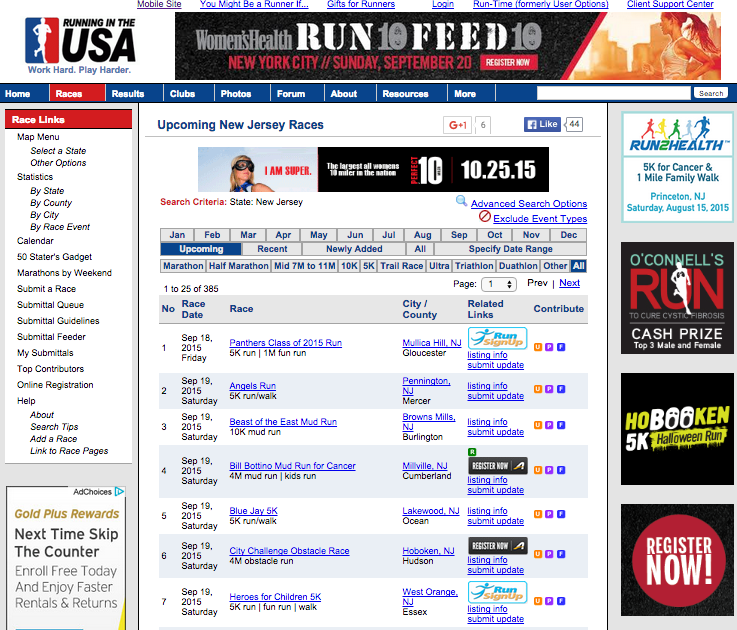 RunningintheUSA.com is the largest calendar of race sites in the US with 48,633 races listed. They use Active.com’s, RunSignUp’s, and Race Entry’s automated API to load races from each of us – that is why you see the little logos for each of us on the calendar. This probably means that we are unfairly represented as they do not get every race from every other of the 100+ registration providers in the market. Note they also remove non-pure running events. There are over 100 registration systems, and not all of them have race listings. For example we could not find a list of Chronotrack Live races, but know from their public statements that they processed over 1 million registrations in the first half of last year. Likewise, IMAthlete is much stronger than this list shows because of a number of large events they provide registration for like the LA Marathon and Gasparilla Distance Classic. In addition, the search tools may include non-endurance race events in some cases (for example Events.com mixes a lot of different types of events and there is no advanced search filter). And search methods change from period to period – for example RaceIt introduced a much better race search, which allowed for a better count of races on RaceIt, although RaceRoster and Running Guru took away the ability to do a count from search. Active changed their search criteria as well so it is difficult to get an exact count of races in the US, so we have eliminated them from the current report. And final caveat to this data is that some race calendars may include races that do not have registration on their sites (the RunSignUp data is accurate since we have a search flag internally we can use to look for races that are open for registration on RunSignUp). Anyway, these rankings among all US websites are from April 5 and will change. The % change is from the Spring of last year. To put some context on these numbers, RunSignUp is doing about 10 Million Page Views per month now to get in the Top 6,000 sites. Active has recently added a line in their press releases saying they get 50 Million views per month to get to the 1,815th place. In March last year, we were doing the same page views to rank about 4,800 – so the volume to achieve a ranking is getting larger. The big change this year is that the scale from Alexa may have changed. Alexa generally uses the past 3 months of data and our page views are up 2% over last year. Perhaps Alexa is measuring more mobile apps and there are simply more sites stuffed into those with more than RunSignUp’s 28 Million Page Views in Q1. We are adding an analysis of the Top 100 festivals of 2016 as reported by Running USA. This table shows the total # of registrations for each vendor as well as the # of races that are represented. We broke out Rock and Roll (RaceIt) and Disney (Active) and Chronotrack Live (CTL) is owned by Lifetime Fitness (LTF) since they have such a large volume, so to get the total for those vendors, add the two numbers together. Our objective in doing this was trying to understand how far we had gotten with our growth. We are guessing that we are at about 11% market share with our 4.2 M paid registrations in 2016 – assuming there are about 40 Million Paid Registrations in the US. We are really proud of the impact we are having on the endurance and race market. Especially since RunSignUp is a lot more than registration, as we have a number of other offerings. The Race Director helps Timers score and provide results for over 11,000,000 participants annually. RD Go, our Cloud based Scoring and Results system used by Timers and Races hosts results for over 5,000 races and sends tens of thousands of result notifications each weekend. RaceJoy is by far the leading race GPS Tracking solution in the market. RunSignUp for Clubs is used by hundreds of clubs to help with membership management and tie to races. Our Promotional Tools help races with growing their races with tools like free Email Marketing, Referral Rewards, Facebook and Social integration, integrated Google Analytics and ad tracking and more. And our free services like Sponsor Management, Volunteer Management, Check-In App, Race Calendar Widgets are used by many races beyond those who do registration with us. Thank you to all of our customers who provide us great feedback on what is needed in this market, and who tell their friends about us!